2015 Theme - "Self-Supporting Behaviour"
This is the time of the year for renewal, reflection and often regret! The years fly past and before we know it, regret's emerge because we 'didn't get a chance' to do those things we wanted to, or more importantly, needed to. Our habits define us. I have often talked about the effort required for change, as "habits need to be coaxed downstairs, one step at a time!" I have taken to talking to myself (yes ... at times I even get an answer!) asking, "is what I am doing self-supporting behaviour?". There is only one person you can influence 100% of the time. That person is you. I have found this phrase to be a great help to motivation. I love it! As always, your health and fitness is important. Some of you may decide to tackle some of the events that are listed below. Apart from the participation and achievment, it is the training you did to get there, that counts. This is an example of self-supporting behaviour. Have a great year everyone. I'll see you on the path! Come and join our Nordic Walking team and challenge yourself to one of these events. It is during the humid weather that our feet often suffer from blisters. This is due to the fact that the skin remains moist and becomes softer. Fungal infections also prosper in these conditions. The inside of the socks are now nicely covered with powder. They feel great when you put them on! "Nordic Walking, results in a significant increase in oxygen use and caloric expenditure compared to regular walking, without significantly increasing perceived exertion". Church, T. S., Earnest, C. P., & Morss, G. M. (2002). Field testing of physiological responses associated with Nordic Walking. Research quarterly for exercise and sport, 73(3), 296-300. 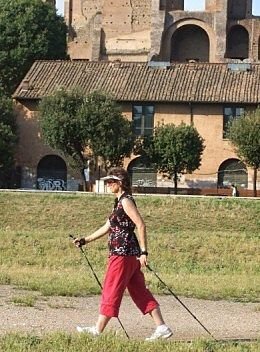 "Since Nordic Walking’s introduction in 2005, June Stevenson has been a leading, passionate pioneer of this unique exercise. Through teaching and encouragement, within the Auckland Community, June has fostered opportunities for people to start and continue with this activity, as a way of implementing changes in their lives. 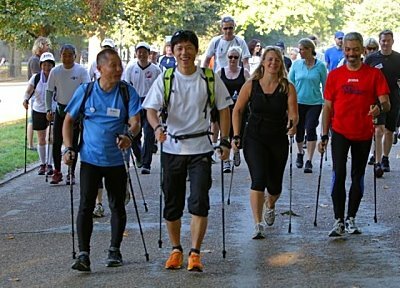 The most significant initiative has been the establishment of Nordic Walking groups throughout the region. To establish groups and provide training, June has travelled throughout Auckland, increasing individuals’ accessibility within their ‘local’ community. This has encouraged exercise participation and adherence, especially amongst people who would not normally exercise regularly. Many of these people are older women; some having significant health issues that has benefited from Nordic Walking. Included are special health groups such Parkinson’s, Neurological and Green Prescription. This group dynamic encourages regular exercise, normally inaccessible to them. It provides a safe environment, increased exercise adherence and social-bonding. Significant about June’s initiatives is her time spent establishing the ‘local’ group, empowering members to take responsibility for managing their Nordic Walking group, planning routes, social activities, events, welcoming new members and visiting other groups. Furthermore, June has encouraged and coached many Nordic Walkers to take on endurance training for marathons and ultra-distance events. Many who would have never considered participating. Their success has increased belief in their capabilities to achieve, leading to ongoing self-efficacy to continue with training. In 2013, the “Nordic Kiwis” half-marathoners raised over $10,000.00 for the NZ Cancer Society".